I liked to sing along with the animated cartoon theme song: "He's the military hero of the nation, though he doesn't always follow regulation. At at the sound of reveille; he is here for you to see; and we know you'll always laugh at Private Beetle Bailey - Beetle Bailey! Ask the general, colonel, major, and the captain; the lieutenant and the sergeant and the corporal. They will tell you with a shout, they would gladly live without a certain private by the name of Beetle Bailey- BEETLE BAILEY! Still being produced by its 91-year-old creator Mort Walker (with help through the years from others, including his sons), Beetle Bailey is one of the longest-running comic strips in history! Does anyone remember a war comic named Beetle Bailey...I think it was about the time of the Korean War, or am I dreaming! I would like to see Beetle and Co. make another return visit to his sis and bro-in-law, Hi and Lois. WPIX TV Ch.11 in NYC 50 years ago. I am an alum of The University of Missouri at Columbia, MO, as is Mort Walker. 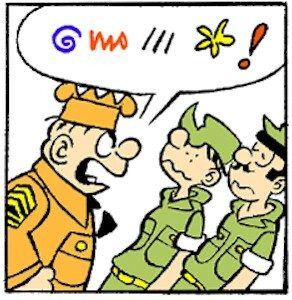 Beetle Bailey was created as an MU ("Mizzou") student. There is now a statue of Beetle sitting on a bench outside of the spot where once stood a beer joint called The Shack, where Beetle was created.